Genealogists are detectives, so here’s a case many of us might be able to help solve. David Solly Sandler of Australia is seeking 2,000 South Africans – the descendants of 60 Ukrainian war and pogrom orphans, known as Ochberg’s Orphans. In 1921, Isaac Ochberg, representative of the South African Jewish Community, travelled to Poland and the Ukraine and brought back with him to Cape Town 167 “Russian, Ukraine and Polish War and Pogrom Orphans” plus 14 “attendants and nurses,” mainly older siblings. Half the children were placed in the care of the Cape Jewish Orphanage (later Oranjia) and half went to Johannesburg, under the care of the South African Jewish Orphanage (later Arcadia). Many children were adopted by Jewish community members, who contributed generously to a fund to bring the children to South Africa and care for them. What’s David’s connection to Arcadia? Born in 1952, David grew up from age 3-17 at Arcadia, the South African Jewish Orphanage in Sandringham, Johannesburg. Now a semi-retired chartered accountant, he lives in Western Australia and has completed two books on Arcadia (see below for more information). For the history of the orphanage – established in 1899 – click here. David is now in month 18 of the 27 months he’s allocated to record the life stories of the Ochberg Orphans. Of the 181 children, the stories of 90 have been recorded, contact has been made with another 30, but 60 still remain to be contacted. How did he arrive at this number? David believes – for the so far “missing” 60 – that each child was born around 1910, married and had three children, nine grandchildren and 27 great-grandchildren, thus there should be more than the estimated 2,000 descendants cited above. Of course, no one knows for sure. However, what is really important in this story is that many descendants might not know their connection to the Ochberg Orphans. The children did not often speak about this and many tried to hide the fact from their children because of the stigma of being an orphan. Today, as for the general South African Jewish community, half of the 2,000 descendants likely have left South Africa and now live around the world in Israel, Australia, Canada, New Zealand, the UK and the US. Here’s the kicker – here are the names of these orphans. If you have someone with this name in your family tree, born c1910, there’s a chance you might be an Ochberg Orphan descendant, so read the list carefully and if you find a name of interest, contact David (email below). David adds that by the end of 2010, the lifestories of some 130 of the children will have been collected. They will be included in a book to be published and sold internationally with all proceeds going to Arcadia and Oranjia, as are the Arcadian Memory Books. Readers who recognize names of interest should email David for more information, or if you are a descendant and want your family’s story included. “100 Years of ARC Memories” (March 2006) celebrates the centenary book of Arcadia, formerly the South African Jewish Orphanage. 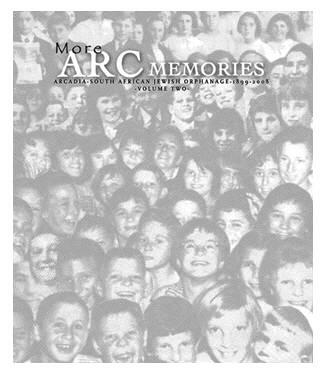 “More ARC Memories” (December 2008) is the sequel to the first volume, and includes 17 chapters on the Ochberg Children. Together, the books total 1,100+ pages and hold the memories of more than 250 children. All proceeds go to the Arcadia Children’s Home that still exists and looks after children in need. By the end of 2009, some Rand 365,000 had been raised and the target is Rand 1 million. The set of two books costs $100 plus $10 shipping (click here for more information). Return to the shtetlach of yesteryear as John Diener highlights an emotional 2005 journey back to the Ukraine and towns previously in Galicia, on Monday, March 15. The program begins at 7:30pm at the Gelber Conference Centre, 5151 Cote Ste-Catherine/1 Carré Cummings. It is sponsored by the Jewish Genealogical Association of Montreal in association with the Jewish Public Library. In “Journey Back to the Shtetl,” Diener, who is the vice-president of the Jewish Genealogical Society of Ottawa, will also cover the rewards of this kind of adventure. He visited Grzymalow, Skalat, Kamenets Podilsky, Zhvanets, Sokolets and Hotin. All are today in Ukraine. Tracing the Tribe’s paternal grandfather’s FINK connection is to Skalat and nearby Suchostaw. Diener also visited the Auschwitz-Birkenau and Belzec camps in Poland, and spent time in Krakow and Warsaw. If your roots are in Galicia, you might find this program very interesting. Many special interest groups hold luncheons during the annual conference, set for July 11-16, in Los Angeles. Announcements are beginning to come through, such as Gesher Galicia’s program for this event, which will take place Monday, July 12. In 1942, as the Nazis intensified their hold on Eastern Europe several Galician Jewish families disappeared into the vast underground labyrinths of western Ukraine. The group ranged from grandmothers to toddlers and for the next 18 months, they lived, worked, ate and slept in caves under the feet of the Nazis. One of history’s most remarkable survival epics, it was almost forgotten until an American caver found the remnants of the underground hideout and set out to find the survivors of Priest’s Grotto. Hear the story from caver Christos Nicola as he presents the story, which combines natural history, family history and genealogical research come together. In 2003, while exploring a remote cluster of caves near Korolowka, a team of experienced cavers and adventurers, including Nicola, unexpectedly uncovered artifacts indicating that the caves had once been inhabited. Following the clues, they discovered an astonishing and poignant story of Jews who endured a perilous life and survived to tell the story. Nicola located six survivors, most from the extended Stermer family. It turned out to be an more extensive story, covering two cave sites and nearly two years underground. Nicola has devoted more than 30 years to the study and exploration of caves in the FSU, Caribbean, Europe, and the Americas. He is founder of the Ukrainian American Youth Caver Exchange Foundation – a student exchange program dedicated to fostering the exchange of information between young cavers in America and Ukraine. In addition to the luncheon presentation, Nicola will also be speaking during the conference about the July 2009 reunion trip of Korolowka survivors and his work with the Borschev (Borszczow), Ukraine Museum, along with a book sale and signing. The luncheon requires an added fee. Only conference attendees may attend and you must be registered to add on this luncheon. Click here to add the event if you have already registered. Click here if you have not yet registered. For all conference details, click here. The complete conference program will be posted at the end of March or early April. “Family Research in Greater Hungary” will be presented by Vivian Kahn, at the San Francisco Bay Area Jewish Genealogical Society’s next meeting on Sunday, February 21. The program begins at 1pm, at the Oakland Regional Family History Center. Vivian will provide an overview of the history of Hungary’s Jewish community and discuss resources available to those researching roots from the current and former territory of Hungary, including archival records in Slovakia, Romania, Ukraine, and Hungary and sources such as burial and military records. 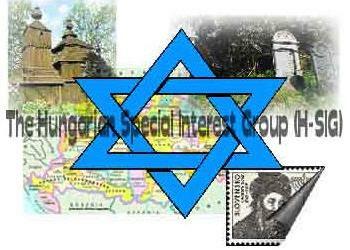 The session will describe and provide tips for searching JewishGen’s All Hungary Database, – one of JewishGen’s largest all-country databases with nearly a million records -with information on individuals living in areas in present-day Hungary, Slovakia, Croatia, northern Serbia, northwestern Romania, and subcarpathian Ukraine. Vivian will discuss some of the SIG’s current projects and demonstrate additional online resources. The Hungarian SIG coordinator, she moderates its discussion group. An experienced researcher, Vivian has presented workshops on Jewish genealogy and, in particular, Hungarian Jewish family research at the annual international Jewish genealogy conferences and for other groups. She’s been investigating her ancestral roots in pre-Trianon Hungary for some 18 years, and has traveled to Hungary, Slovakia, Israel and Salt Lake City. Additionally, she is familiar with the wide range of resources for information on Jewish families in her areas of interest. See her family website here. JewishGen vice president for SIG Affairs, Vivian is coordinator for SIG and Research Group participation for JGSLA 2010. Is your research focused on historic Hungary’s Maramaros county? Today it is Maramures county, Romania and sub-Carpathian Ukraine. This announcement should encourage researchers of these areas to jump for joy! It also supports that old adage: If you want something done, ask a busy person or a group of busy persons! Brooke Schreier Ganz is definitely one of those people, as are Sandy Malek, Vivian Kahn and others. Despite their considerable personal and professional responsibilities – not the least those connected to JGSLA 2010 – this is what they and other volunteers are working on right now. She has asked Tracing the Tribe to inform its readers about this broad project that should assist so many more researchers to find out more about their families. There’s a new project underway to index Jewish vital records for towns that were located in the former Hungarian county of Maramaros. Today, these towns are split between Maramures county in northern Romania and the Zakarpattya (sub-Carpathian) region of southwestern Ukraine, so this project will be valuable for researchers of all three areas. 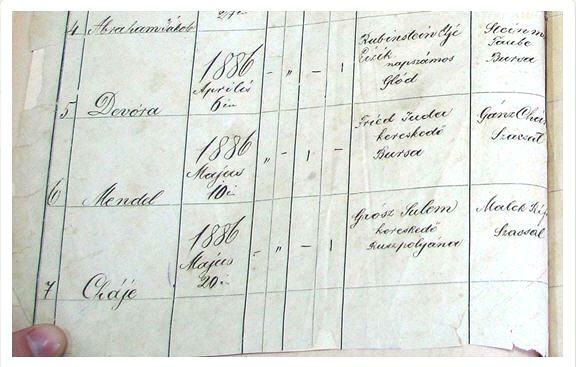 Brooke has completed a first-ever inventory database of all of the specifically-Jewish vital records (pre-1896) known to be held in the Romanian National Archives branch in Baia Mare, Romania, which is where most of the Maramaros towns’ records are stored today. She has put it online on the project’s website (see below). Both modern town names and many former/alternate/Hungarian names are listed, and all are searchable. Using that new inventory database as a guide, and with the help of a great researcher in Romania, the group has started to obtain high quality digital photographs, page by page, of many of the old Jewish register books stored in Baia Mare, encompassing thousands of Jewish records. They hope to acquire more in the future. Above find a birth register page from Sacel, Romania. This project will index these records, placing data into spreadsheets, and submitting all the spreadsheets for inclusion into the various free JewishGen databases (All-Hungary,All-Romania, All-Ukraine, etc. ), so that they will be available to everybody. These register books have NOT been microfilmed by the Mormons. 1) Which towns from Maramaros county are known to have surviving Jewish vital records stored in the Baia Mare archives? Baia Mare (Nagybana), Berbesti (Bardfalva), Birsana (Barczanfalu), Bistra (Petrovabisztra), Bocicoel (Kisbocsko), Bocicoiu Mare (NagyBocsko), Bogdan Voda (Konyha), Borsa, Botiza (Batiza), Breb, Budesti (Budfalu), Calinesti (Felsokalinfalva), Campulung la Tisa (Hosszumezo), Cornesti (Somfalu), Craciunesti (Karacsonfalva), Desesti (Desze), Dragomiresti (Dragomerfalva), Dragos Voda, Feresti (Fejerfalu), Giulesti (Gyulafalu), Glod, Harnicesti (Hernecs), Hotinka (Hoteni), Iapa (Kabola-Patak), Ieud (Jood), Kabalacsarda (Kabola Csarda), Leordina (Lerdene), Lunca la Tisa (Lonka), Mara (Kracsfalva), Moisei (Mojszin), Nanesti (Nanfalu), Ocna Sugatag (Akna-Sugatag), Oncesti (Vancsfalva), Petrova, Poienile de sub Munte (Ruszpolyana), Poienile Izei (Sajo-Polyana), Remeti (Remete), Rona de Jos (Alsorona), Rona de Sus (Felsorona), Rozavlea (Rozalia), Ruscova (Ruszkova), Sacel (Szacsal), Salistea de Sus (Felsoszelistye), Sapinta (Szaploncza), Sarasau (Szarvaszo), Sarbi (Sirbi), Satu Sugatag (Falusugatag), Seini(Szinervaralja), Sieu (Sajo), Sighetu Marmatiei (Szighet), Stramtura(Szurdok), Tirgu Lapus (Magyarlapos), Vadu Izei (Farkasrev), ValeaStejarului (Disznopatak), Valeni (Mikolapatak), Viseu de Jos (Alsovisso), Viseu de Mijloc (Kozepviso), Viseu de Sus (Felsovisso). Bedevlya (Bedohaza), Bila Tserkva (Feheregyhaza), Bilovartsi (Kiskirva), Bushtyno (Falu-Bustyahaza), Chumalovo (Csomanfalva), Dobryanskoye (Nyagova), Drahovo (Kovesliget), Dubove (Dombo), Dulovo (Dulfalva), Hanychi (Ganya), Hrushovo (Kortvelyes), Kalyny (Alsokalinfalva), Kolodne (Darva), Komsomol’s’k(Nemetmokra), Kosivs’ka Poliana (Kaszopolyana), Krasna (Taraczkraszna), Kryve(Nagykirva), Lopukhiv (Brusztura), Neresnytsia (Nyereshaza), Nizhneye Selishche (Alsoszelistye), Novobarovo (Ujbard), Novoselytsia (Felsoneresznice), Nyzhnya Apsha (Alsoapsa), Okruhla (Kerekhegy), Pidplesha (Pudplesa), Pryborzhavs’ke (Zadnya), Rus’ka Mokra (Oroszmokra), Rus’ke Pole (Urmezo), Shyrokyy Luh (Szeles-Lonka), Solotvyno (Slatina), Sredneye Vodyanoye (Kozepapsa), Tereblya(Talaborfalu), Teresva (Tarackoz), Ternovo (Kokenyes), Tyachiv (Tecso), Uhlia (Uglya), Ust’-Chorna (Kiralymezo), Velykyy Bychkiv (Kisbocsko), Verkhnie Vodiane (Felso-Apsa), Vil’khivtsi (Irhocz), Vodytsia (Apsita), Volovec (Bordfalva), Vonihove (Vajnag), Vynohradiv(Csamato), Yasinya (Korosmezo). 2) What years do the records cover? Jewish birth, marriage, and death records exist for almost every one of the “Romanian” towns listed above for the period of 1886-1895. About two thirds of those towns also have birth and death records for the 1870s-1886. A few towns have earlier coverage; one has a tiny number of birth records back to 1772! “Ukrainian” towns’ records coverage is more uneven, but for some of the little towns north of Szighet, some record books have survived (with a few gaps) back to 1851. See the website for a full listing of all known record types and years for each town. That database will be continually updated and corrected as we learn more. 3) What are the records like? They are nearly all in Hungarian (some old ones in German and, for one town, in Hebrew) and are generally very easy to understand, even if researchers don’t know Hungarian. Handwriting ranges from decent to excellent. Sample photos of some records are on the website. Child: Given name, date of birth, gender. Father: Surname, given name, hometown, occupation. Mother: Maiden name, given name, hometown. Notes (may include Godfather’s name [often a relative, such as a grandfather], other information). Other surnames mentioned in this record. Other towns mentioned in this record. Casting a wider net is important when working with Eastern European records. According to this project, birth records for one town showed that 99% of children born in that town in the 1880s had at least one (and sometimes both) parents born in other nearby towns. This means that your family of interest may be found in more towns than you might know about. 4) How can I help? Readers and researchers of these areas can help the Maramaros/Maramures indexing project: Volunteer to help transcribe the old records, and/or make a donation (tax-deductible in the US!) to JewishGen to help acquire photographs of more old record books. See additional details on the website. The project is also looking for people with records indexing experience to help manage all of this! Please e-mail if you might be interested. 5) What’s the website address? Special thanks go to Dan Jurca, Beth Long, Sam Schleiman, Vivian Kahn and Sandy Malek for helping to get this project off the ground. Readers with questions may email Brooke.